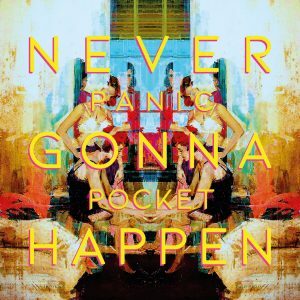 The debut EP from Panic Pocket – Never Gonna Happen – is out today digitally and on limited edition CD. Described as ‘stars in the making’ by For The Rabbits we’re thrilled to share this one – for a band who hadn’t ever picked up instruments until 2017 this four-track EP of hook-laden, salty and funny-as-hell electro-pop is really quite something. When premiering the video for Pizza In My Pants from the EP For The Rabbits said, “Never Gonna Happen feels like a triumphant moment for the band, proof of the power of friendship, fun and personal expression to create wonderful, relatable music. They might be the DIY-scene’s best kept secret, yet increasingly it’s hard to see them staying that way, Panic Pocket are stars in the making.” Read the full piece here. Sophie and Nat also put together a Five Favourites piece for Get In Her Ears in which they pull out tracks by Aimee Mann, Rilo Kiley, Dar Williams, PJ Harvey, and Best Coast. Get In Her Ears say the EP is “create luscious slices of shimmering indie-pop with a twinkling charm and impeccable tongue-in-cheek wit”. Read the full piece here. Copies of the limited edition CD are going fast but you can grab one here along with downloads, and you can do the band a massive favour by following and saving the track on Spotify, or adding it to your playlist, if you prefer your music over there. You can find them on all the usual streaming and digital download services too. Make sure you’re signed up the Reckless Yes mailing list for latest news on all our releases and check out the rest of our roster here. If you’d like to get in touch with us take a look at our demo submission guidelines for the best way to do this.